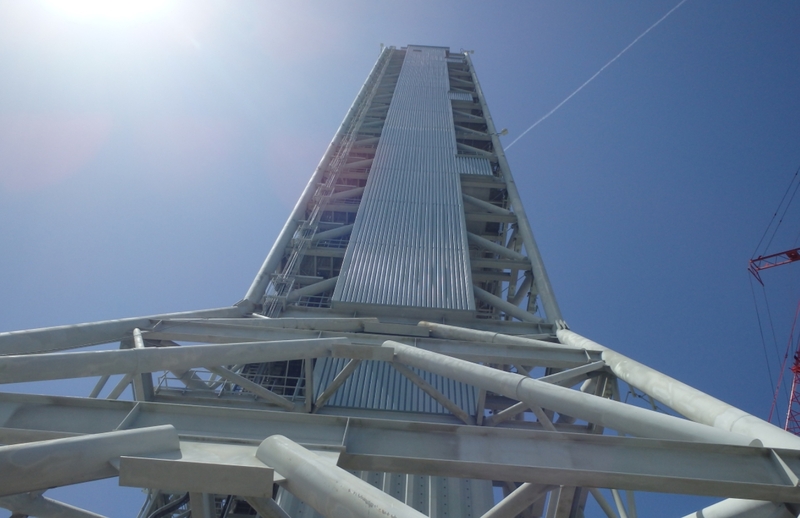 The huge Mobile Launcher (ML) that will be used to launch NASA’s Space Launch System (SLS) is leaning. However, NASA insists it is structurally sound and does not require modifications to counter what is portrayed as “some deflection”. The ML is undergoing a conversion process, realigning it for a role with SLS after initially being constructed for the Ares I rocket. The ML began construction for the Ares I rocket almost ten years ago, marked by trestles and girders arriving at the Kennedy Space Center (KSC) by barge in February 2009, beginning the opening phase of work to create a base platform – one which was designed to be lighter than the Mobile Launch Platforms (MLPs) that previously hosted the Space Shuttle stack. 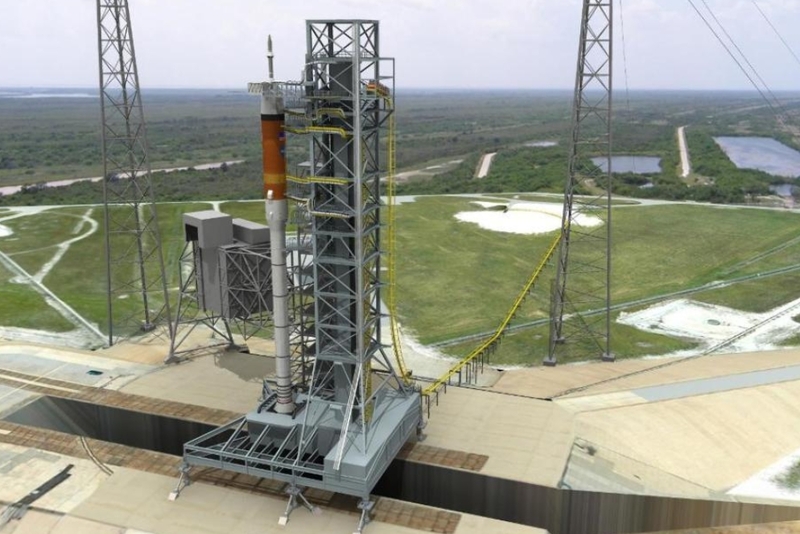 This base – which can be picked up by NASA’s modified Crawler Transporters – is the platform for a fixed tower that hosts an array of umbilical connections and access for engineers and astronauts. As with all large projects, design changes were added during the initial construction phase, including the winning concept from the Emergency Egress System (EES), a roller coaster car system that would race astronauts – and/or pad crews – away from a major incident with the vehicle. Engineers from Disney were cited as members of the large design team. 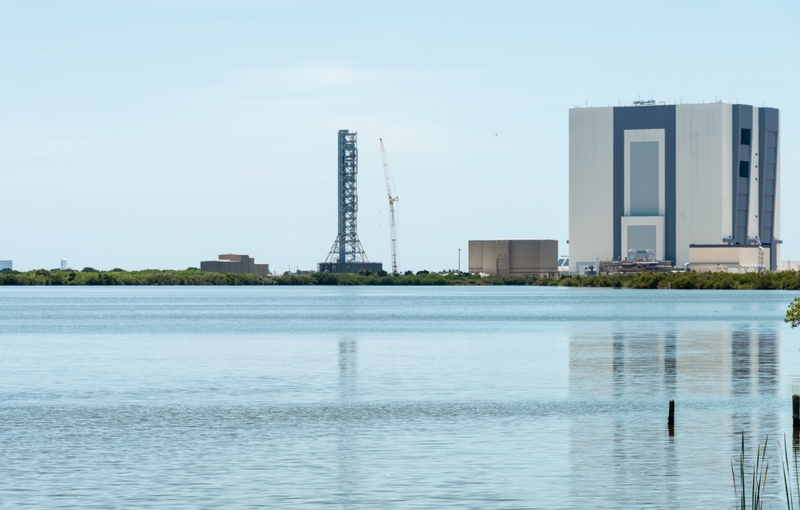 When the Constellation Program (CxP) was canceled by President Obama, the Mobile Launcher – by now a complete structure – was left parked up near the Vehicle Assembly Building (VAB) without a future role. When the SLS program came to life, the ML was provided with a reprieve. However, large-scale design changes were required due to its previous role being one that was dedicated to the single Solid Rocket Booster “stick” design of Ares I. The SLS rocket would require a completely new launch mount to cater for four RS-25 engines and two Solid Rocket Boosters. It would also require numerous changes and additions to the array of umbilical connections on the tower. Although that conversion work has been ongoing for several years, progress is now being made on the testing and installation of the first set of umbilicals. Arriving at the Launch Equipment Test Facility (LETF), the arms and connections would be put through real-scenario testing at the special facility at KSC before being set to the ML for installation. The Core Stage Inter Tank Umbilical Arm, the Core Stage Forward Skirt Umbilical Arm, the Orbiter Service Module Umbilical Arm and the Vehicle Stabilizer Porch are now all installed onto the ML Tower. However, while delays to pre-planned installation schedules can be expected during such a major project, a large delay to the installation timeline for the Crew Access Arm (CAA) came with notes of concern for the ML. The notes spoke of engineers being concerned about a lean towards the North – which would be towards the rocket when mated – with the angle of the leaning claimed to be seen as increasing when the Vertical Stabilizer porch was installed. It was also claimed the ML Tower is twisting and this issue increased when the porch was installed. This was cited as the reason additional arm installations onto the Tower were placed on hold, until the leaning-twisting issue is understood. Next in line for installation are the ICPS (Interim Cryogenic Propulsion Stage) Umbilical Arm, the Crew Access Arm and the two Vehicle Stabilizer Arms. However, they did expand on the specific issue, mainly to note it is understood and does not currently require any additional mitigation or modification to the ML. “NASA’s mobile launcher is structurally sound, built to specifications, and does not require a design change or modifications. 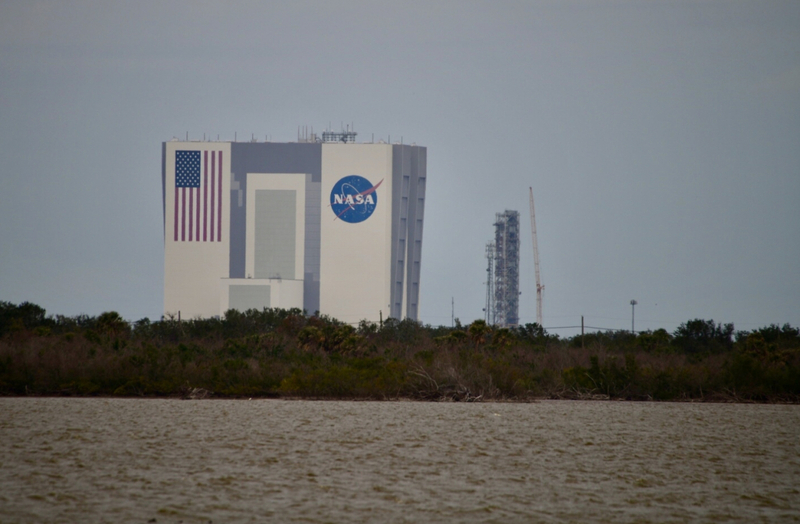 As expected, the mobile launcher is not perfectly still,” a NASA spokesperson added. NASA did add that the “deflections” are unlikely to be related to its initial construction but may be the result of the modifications employed to convert it from Ares I to SLS. “The first surveys of the tower in 2011 indicated some deflection and imperfections, which is not unusual for big steel construction of this magnitude. 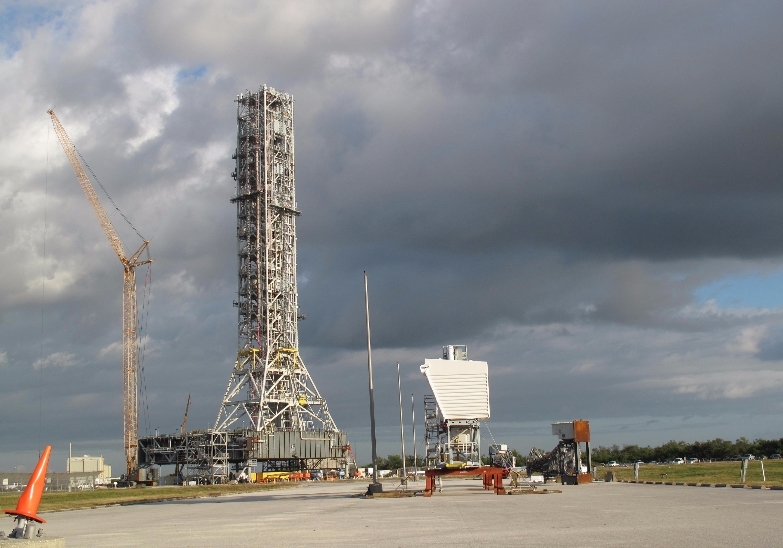 This is likely due to a combination of welding the different levels and modifying them one at a time from the mobile launcher’s original design for the Ares rocket, changes introduced in the structure during these modifications, and the additional mass. NASA added that the lean is understood and so far matches predictions. They will continue to monitor the deflections as more umbilicals are added via the use of laser survey measurements. “There are also several natural effects that can influence movement of this gigantic steel structure, including wind, temperature, and vibration during the move on the crawler transporter. NASA and its contractors have models that predict the amount of additional lean after parts are installed, and use laser survey data to confirm the data. Should the movement require additional modification in the future, a plan has already been discussed. According to ML engineers, one possible “fix” would be to remove all the lightweight fiberglass grating on the tower and replace it with “welded in place steel grating”. The fiberglass grating was part of the original Constellation Program design that was meant to save weight on the Ares I ML. However, switching to steel grating, and using the grating to make the ML Tower stiffer, would add weight to the ML, which is already overweight from its “desired” mass. Steel grating could add another 750,000 pounds to the ML, if all the fiberglass grating was replaced with steel grating, taking the ML a million pounds over its desired weight target. This mass would not be a showstopper for SLS, at least for the Block 1 rocket which is now currently set to debut in 2020. However, if this ML is further modified for Block 1B, the weight would be in the region of 2.5 million pounds over the desired roll out weight. 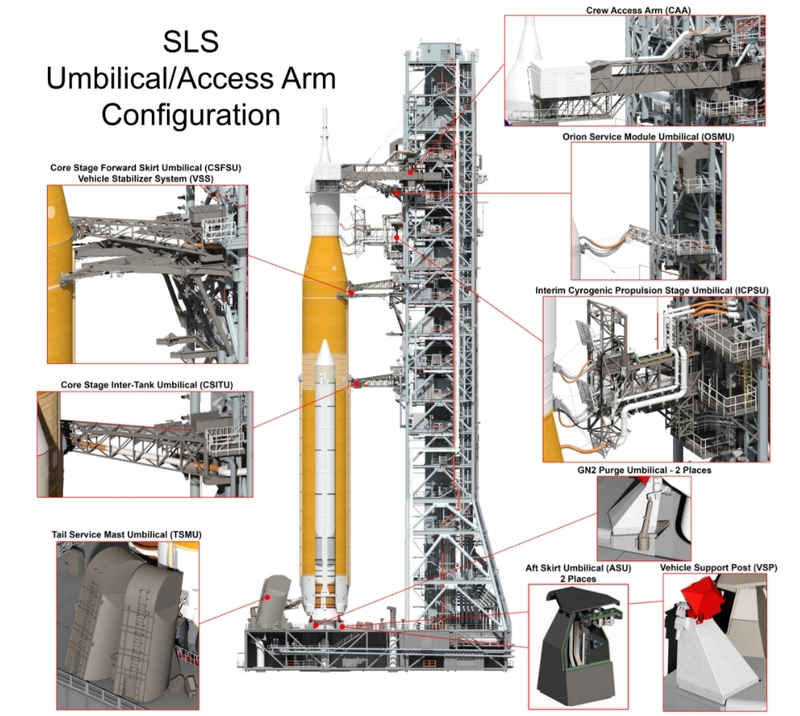 Interestingly, this plays into NASA’s interest in a new, purpose-built ML for SLS Block 1B. Late last year NASA managers spoke of their desire to have two MLs, avoiding a multi-year delay between EM-1 and EM-2 due to the vast amount of modifications required to redesign the ML to cater for the larger SLS Block 1B, along with the potential to continue to fly Block 1 SLS missions off the current ML. 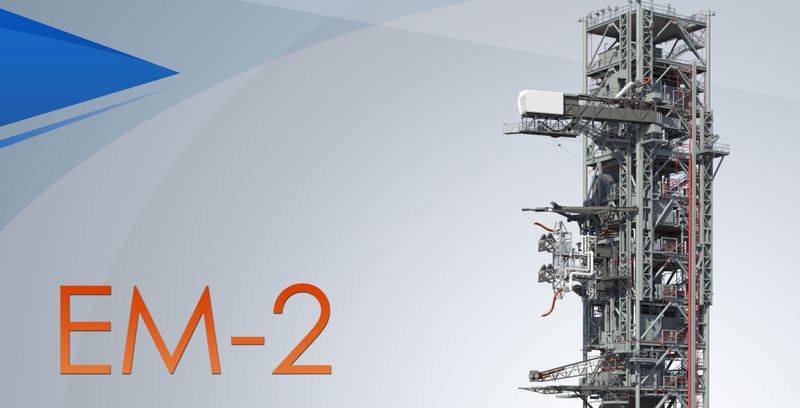 While the second ML would cost around $300m, it could be seen as “economically viable” based on the amount of money it would cost to revamp the SLS ML from Block 1 to Block 2, while also potentially increasing SLS mission options and launch cadence. A decision point is expected this year.